A good grape harvest in midsummer was cause for celebration in ancient Israel, promising an abundance of fruit to make wine, raisins and sweet syrup for the coming year, as well as the vine leaves to be brined and stuffed with meat, vegetables and rice. Because the harvest began on the 15th of Av (the fifth month in the Jewish lunar calendar), the celebratory holiday was named Tu B’Av (Tu means 15). In time, the festival also came to celebrate love and its pursuit. The Talmud describes how unmarried girls, rich and poor alike, would dress in plain white clothing and sing and dance under the full moon in the vineyards surrounding Jerusalem (Ta’anit 30b–31a). Many betrothals ensued. Today, the grape harvest is still celebrated in Israel, and many Israeli couples choose to get married on Tu B’Av for the “luck” it may bestow. Consider it the Jewish Valentine’s Day. This Tu B’Av (July 26), I hope you spend the day with someone you love and enjoy these recipes that give thanks for the fruit of the vine, as well as pay homage to the No. 1 food of love: chocolate. I’ve thrown in some pretty pink for love, as well. This cold salad, featuring Israel’s summer bounty, is perfect for a hot summer’s day. French recipes titled Veronique signify the inclusion of grapes. This one is a snap if you ask the deli person to cut the meat into half-inch thick slices (No. 35 on some slicers). 1. Cut the chicken into half-inch cubes and transfer to a medium sized bowl. 2. Slice the full avocado into half-inch cubes and place in a small bowl. Add about ¾ of the lime juice. Toss gently to coat the avocado cubes. 3. Mix in the halved grapes with the chicken. 4. Stir the mayonnaise in a small bowl to make it smooth. Add ketchup, savory and sweet vermouth. Mix well to form a smooth sauce. 5. Drain the avocado cubes. 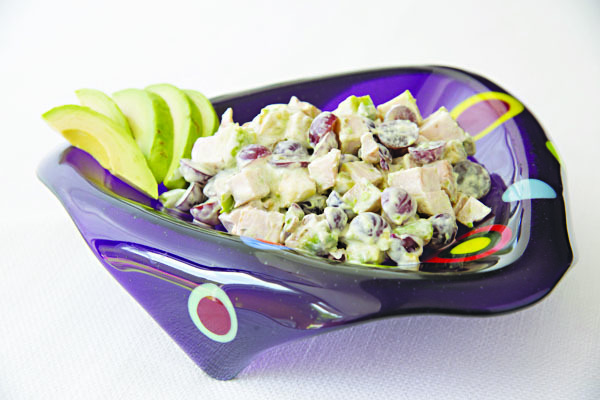 Using a rubber spatula, gently toss the avocados with the chicken and grapes. 6. Carefully blend in the mayonnaise mixture so that you don’t break up the avocado chunks. 7. Thinly slice the remaining avocado half, place in another bowl, and coat with the reserved lime juice or any extra residual juice from the drained avocado cubes. When ready to serve, arrange the slices over the top of the prepared salad and sprinkle with toasted almond slices. •Whenever you’re mixing ingredients that include soft fruits or vegetables, use a rubber spatula; it will prevent the food from being nicked or mashed. •Although mayonnaise appears smooth from the jar, it is imperative to stir it first before adding any liquids to prevent the mixture from looking curdled. What better way is there to relax on a hot summer’s night than with a cheese board, wine jelly (a wonderfully sweet counterfoil to strong and earthy blue-veined or chevre cheeses) and a good bottle of wine (preferably from the wine country in northern Israel)? 1. Combine the wine and spices in a 2-quart saucepan. Heat the wine over medium heat until it is warm but not simmering. Turn off the heat and allow the spiced wine to steep for 30 minutes. 2. Add the sugar and then heat to a rolling boil. Stir constantly for about a minute, until the sugar is totally dissolved. 3. Add the pectin. As soon as the mixture returns to a rolling boil, stir for exactly 1 minute to activate the pectin and then pour the jelly into a clean, 16-ounce glass mold or rectangular dish or two or three 6-ounce ramekins. 4. Cool at room temperature for about a half-hour or until close to room temperature and it begins to solidify. 5. Cover dish(es) loosely with plastic wrap and refrigerate until firm. 6. Unmold the jelly onto a plate and decorate with frosted grapes by tossing the grapes in slightly beaten egg whites or wetting them under water and then rolling them in a small dish with the sugar and then dry them for about 15 minutes or until crusty. •Keep the sugar-coated grapes in the refrigerator once the sugar has hardened. The same process that keeps your refrigerator “frost-free” also keeps the interior as dry as possible, a necessity on hot, humid summer days. Hungarians use sour cream in many recipes because it is readily available. If you would like to make this pareve, you could use soy or coconut creamer. 1. Combine the first seven ingredients in a 3-quart saucepan. Bring to a boil and then simmer for 10 minutes until cherries are tender and flavors have combined. 2. Remove 12 cherries and set aside. 3. Pass the cherries and liquid through a food mill to puree. Alternatively, blend the mixture in a blender or in a processor until mixture is fairly smooth. Return pureed cherries to the pan along with the reserved cherries. Re-heat as you make the Habaras. 4. In a 1-quart bowl, whisk the sour cream, sugar and flour together, combining well. 5. Whisk some of the soup into the sour cream to thin it, then add all of the mixture into the pot of soup. 6. Simmer soup for 5 minutes or until thickened. Cover and chill until ready to serve. •Sour cherries (the traditional type for this recipe) are very hard to find. However, the frozen, sweet variety is not that sweet and will adapt in any recipe calling for tart cherries. •Powdered sugar not only subtly sweetens this soup; it helps thicken it as well because it contains 3 percent cornstarch. How can you talk about love without chocolate? From the beginning of its consumption (when Montezuma was purported to drink 50 cups of chocolate flavored with chili a day to feed his libido) to boxes of chocolates given to lovers, the theobromide in chocolate has wooed many a person to thoughts of love. These cookies are perfect for summer. Not only can you have them on hand to bake at a moment’s notice, but also transporting these cookies to a summer picnic will slightly warm them up to their original gooeyness. 1. Combine the 10 ounces of chocolate and the butter in a 1-quart glass bowl. Microwave this mixture on high for 1 minute. Stir. Place bowl back and microwave for another 30 seconds. Remove, stir until all chocolate is melted and set aside. 2. Mix the flour, baking powder and salt in a small bowl and set aside. 3. Beat eggs and sugar in a mixing bowl until light and lemon colored. Add the espresso, cinnamon and vanilla and beat to combine. 4. Add the chocolate mixture to the mixing bowl and beat until all egg mixture is incorporated. 5. Add the flour mixture and mix only until there is no flour visible. Stir in the chopped chocolate or chips. Remove beaters and scrape down sides of bowl. Refrigerate in bowl for 15 minutes. 6. Using a 1-tablespoon portion scoop or a rounded measuring spoon, place dough onto a parchment or foil-lined baking sheet. 7. Freeze dough uncovered until very hard. When frozen, remove individual dough balls to a zip-lock freezer bag and freeze until ready to bake. 8. To bake: Preheat oven to 350 degrees. Place frozen mounds of dough onto a lined baking sheet and bake for 8-10 minutes or until the tops of the cookies are crisp but very soft to the touch. Cookies will harden a little as they cool. 9. Let cookies cool for 5 minutes if you want them to be hot and gooey; longer if you want them to hold their shape a little better. • Baked cookies may be refrigerated and then re-heated in a microwave for 20 seconds on high. However, cold, baked cookies are like a cross between a cookie and a truffle and quite delicious. • Gluten-free flour can easily be substituted for the all-purpose flour in this recipe.